We hold DNA nights. Each DNA night hosts a different speaker who is meant to inspire as well as share the determination and perseverance it took to endure their journey. At our last event, we hosted an Olympic bronze medal finalist, who spoke about the trials and tribulations throughout his Judo career and fighting matches. Another speaker we hosted was a professional mountain climber who gave up on his mission to reach the summit of Mt. Everest, and instead turned around after being 300 meters from the top save another climber who was on the brink of death. In the past, we have also had Noam Bardin, one of our investors and the CEO of Waze. 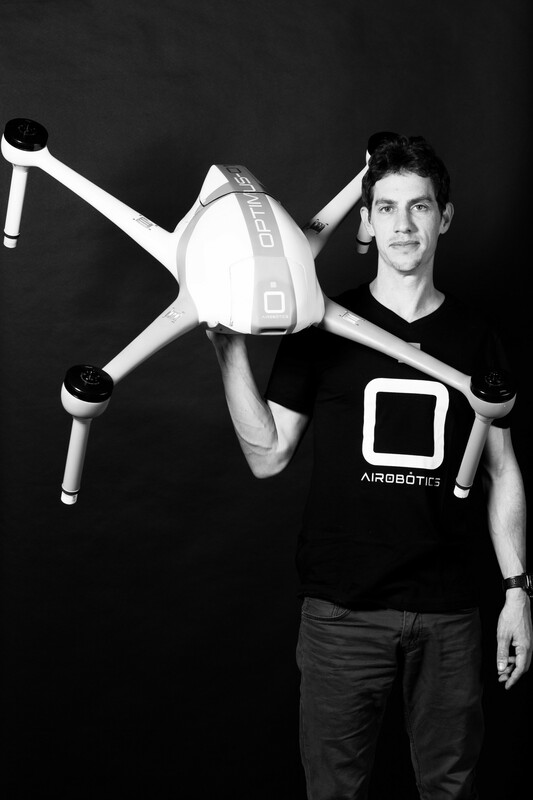 Ran Krauss is the CEO and Co-Founder of Airobotics, a company creating end-to-end, fully automated drone solutions for collecting aerial data and gaining invaluable business insights. Airobotics recently expanded its data-driven automated drone solution to the United States with the launch of their Arizona headquarters. They were also recently named to The Wall Street Journal’s Top Tech Companies to Watch in 2018 list. Airobotics’ culture is based on trust, grit and passion. Millennial or not, I do believe that if you correctly understand what the motivation of the person joining the company is on day 1, then you probably won’t be surprised about what happens down the road. When interviewing, you should ask why they want to join your company. You can see in the eyes when people who are passionate about what they’re doing. It’s very easy to tell if the person you are interviewing is passionate or not based on the questions asked. Are most of their questions centered around the technology and vision? Or are the questions based around severance, pay and options? That’s a pretty strong indicator to tell if the interviewee is right for you. I don’t hire aces or people who aced their way through college. I don’t do this because they don’t know how to fail, and when you’re working in a startup, you will fail time, after time, after time. Your core strength needs to be to get off the floor after you’ve been punched in the nose and to keep going. That’s the most important attribute I look for in my team members. Usually the first question I would ask is what’s your biggest failure in life and how you overcame it. You get a lot of these smart kids from Harvard and Stanford, but a lot of the time you look back at their track record and they’ve always been successful. They’ve been the smartest kid in their class, the best one in their unit in the army, and then the best in their college, and you’re thinking, “dude, you don’t know how to fail.” If I throw you into a startup you are going to fail, for sure. It’s not a test or a structured reality. In fact, it’s the complete opposite. I like the guys who have been hit hard by life and have created that tenacity to get up and keep going. 1. Be a little insane. Being an entrepreneur is one of the most difficult jobs in the world. You go from 0 to 100 very quickly and you’re paving your own way. There’s no one there to tell you the exact formula to be successful. You wake up every morning and it’s a blank canvas. 2. Have good mentors. You need people around you to guide you and give advice when you’re being stubborn about your product or business. 3. Choose the right investors. Some people say they only care about the money, but to me, that’s the last thing that matters. Our board at Airobotics is made up of superheroes who have crazy and innovative ideas. They all have my back and constantly give me advice. 4. Surround yourself with team members who you trust. Experience is important when hiring employees, but to me, trust is paramount above everything else. You are working with these people every day and need to enjoy the time you’re spending with them and have faith in them to get the work done and ask for help when needed. 5. Be innovative not just in your product but also in the way you run your team, how you hire people, and in your overall operation and culture. So many times, companies build products that steer away from the problem they are trying to solve. So, it’s important to keep that focus. You’re not building a product, you’re not building a team — you’re building a business. That always needs to be your focus. Always ask, what are we doing? What are we really building? If you figure out that you are building the wrong product for the wrong market, then pivot. Don’t scatter. That’s something that a lot of startups don’t do well enough in my mind. If you start something and then you realize there might be an opportunity elsewhere and start tweaking the product just a little bit, you could grab an additional part of the market or get more cash causing you lose focus. It’s very similar to a laser beam — you start scattering the ray, you lose your power. It has to be very focused. If you’re not sure, test it. Fail, but do it fast. If you have an assumption that you’re not sure about, test it. Because being able to fail fast and correct your direction is very important. We do that all the time. We have assumptions, we test it in the market, we were wrong, change it. But move. Move, move, move. You only build your product well enough if you’re courageous enough to go the market and test it again and again and again and make sure you have the right direction to keep going. Otherwise, reality is going to bite you at some point, and we all have this tendency to put things in the back of our minds and think, “I know it’s there, but I don’t want to deal with it right now”. If you’re smart enough to tackle the problem from the get go, and say, “whatever the reality will be, I’ll deal with it. I want to deal with it now,” you will be successful. Stay focused, and don’t steer aside. As long as the basic assumption for the market size, ROI, and product market fit is intact, go all the way! You can pivot, but don’t have a lack of focus. Don’t start doing this and this and that. People always think, “what does it matter?” It’s just a little thing here, it’s not going to require a lot of resources.” Yes, it’s going to require a lot of resources. The fact that you actually have to think about it is taking resources. You find something good, you test in the market, you see that there’s a good product market fit — pedal to the medal. The most important thing in the startup world is your team. This is another big cliché, but very, very true. Think of this as Lord of the Rings. You’re starting this voyage from the Shire to Mordor. The people with you is the only thing you have. If you don’t have good people to help you and go on this voyage with you, then you’re not going to make it. You’re not going to make it by hiring talented mercenaries. That first team is the team that builds the entire company. It’s like a crystal, it starts forming around something, and that something needs to be clearly defined when you start building your team. You need to clearly define it to yourself and decide what’s important to you in the company’s culture. A lot of people forget that and instead stay focused around the idea or the fundraising, but this is the most important thing when you start. Retaining talent is something that has to do with the culture of the company. To me, being a founder isn’t necessarily being the one who came up with the idea or the one who raised the money. To me, it’s a group of people who were there from day 1, and who had to build everything themselves from scratch. For Airobotics it was about 15 people who started the company. All of them are still in the company today. They joined and worked their butts off for the last 3 years. Having a team of 15 people who consider themselves founders means I don’t have to work too hard to keep them in the game, because they feel like it’s their own, and it’s theirs, they built it. So, there are about 15 people who I consider as co-founders of Airobotics. Surround yourself with team members who you trust. Experience is important when hiring employees, but to me, trust is paramount above everything else. You are working with these people every day and need to enjoy the time you’re spending with them and have faith in them to get the work done and ask for help when needed. Our team is incredibly important to our company as you cannot always foresee future changes but having a solid roster of co-workers and employees can help you overcome challenges more efficiently.